I just received a new box! For more on what kind of box I’m talking about, check out this post here, then come back and continue reading! And this time it wasn’t a beauty box or a nail polish subscription box- this time I loaded up on food! Do you think all these exclamation marks are conveying how excited I am about the Love With Food box?! I signed up for a Love With Food box a little while ago, I had read a lot of good reviews for this box on other blogs and decided to try it for myself. At $14 a month, every box box that is bought is matched by Love With Food with a donated meal to Share Our Strength, to feed hungry kids in America. Every box contains 5-6 gourmet samples, which if you like them you can go back to the site and buy the full sized versions at discount prices with free shipping. Now on to my box. As a part of this month I received samples of Honey Bunny Graham’s by Annie’s, Caramel Wrapped Pretzel Petite’s by Mom’s Originals, Organic Chocolate Fusions by The TeaRoom Chocolate Company in four flavors: Pina Colada Milk Chocolate, Masala Chai Milk Chocolate, Mayan Pepper Chai Dark Chocolate (60%), and Midnight Mocha Dark Chocolate (72%), I also received Rich Basil + Raspberry Vinegar by Oliovera, Meyer Lemon Extra Virgin Olive Oil also by Oliovera, Masala Chai Blend by Impra Tea, and a few Hazelnut Chocolate Eggs by Ferrero. The packaging was adorable, admittedly, I was surprised at how small the box was. But boy ‘o boy was I surprised at how chock full of valuable samples this sucker was. Four out of the six brands represented in this box were brands that I had never heard of, and five out of six were brands that I had never tried. Why am I mentioning this? Well, because the whole point of sample boxes is that you’re introduced to products or brands you otherwise had not known or tried before- it’s the thrill of discovery! It’s like being the Columbus of gourmet goodies! 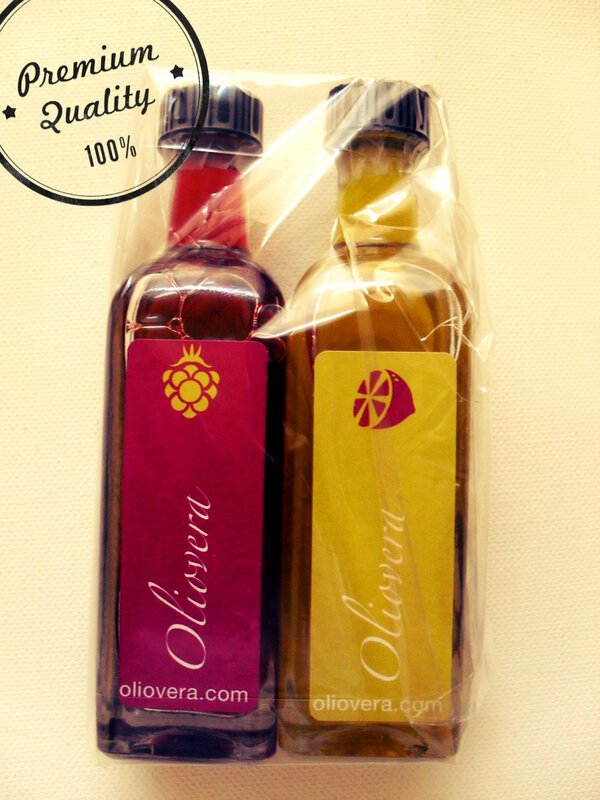 My favorite product out of the whole box had to be the olive oil and vinegar by Oliovera. The size of the sample was massive, sturdy, glass bottles. And the product itself was delicious! The Meyer Lemon Extra Virgin Olive Oil is insane that’s how good it is. It practically screams Spring, and begs to be drizzled over tomatoes and mozzarella. As for the Rich Basil + Raspberry Vinegar, this would be an amazing salad dressing- the flavor of the basil and raspberry really shine through in the vinegar. As for the other products, the tea was amazingly aromatic and smelled of cardamom, cloves, and dried mint- definitely perfect for tea drinkers or chai lovers. The Caramel Wrapped Pretzel Petite’s are adorable and I would totally recommend them as favors for parties, weddings, or gatherings. The Organic Chocolate Fusions really reminded me of one of my favorite computer games- Chocolatier, in which you as the player come up with and manufacture unique chocolate creations just like the one’s that The TeaRoom Chocolate Company have created in real life. The samples I received were cleverly packaged chocolate pastels, which made it convenient to taste the different flavors. In all honesty, I have to say this was some of the best chocolate I’ve tasted in a while (and that’s saying a lot). They’re very distinct flavors that leave a mellow but welcome aftertaste in your mouth. As for the Ferrero Eggs, and the Annie’s Graham’s- both were irresistibly yummy snacks! So if you’re looking for a food box, or better yet, a good cause I’d order myself a Love With Food Box. None of the brands/samples or size of the samples were sub-par and I’ve certainly been introduced to some new favorites. 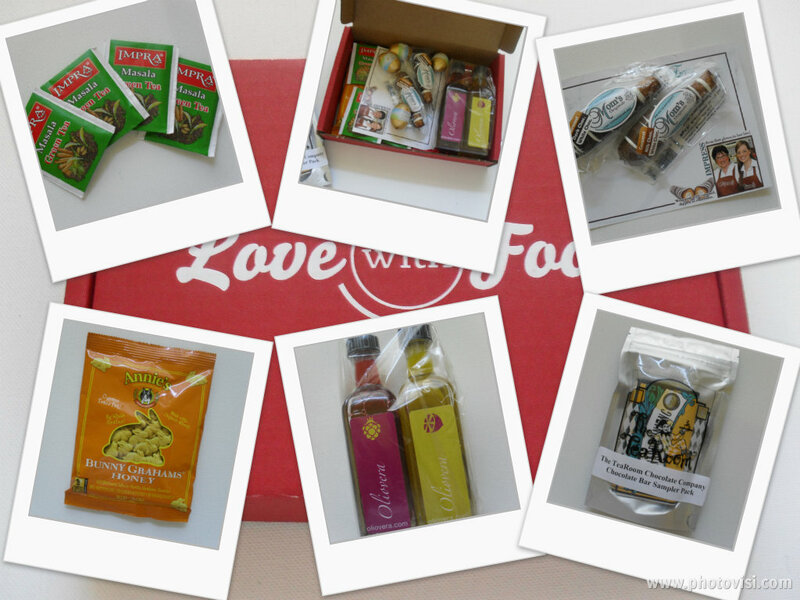 Check out Love With Food here, or follow them on Facebook and Twitter! Have you ever tried a sample subscription service? What did you think of it? If not, would you consider getting a Love With Food Box?